2>Depending on the weather, soil composition and the size of the plant, a normal size wine bottle of water lasts 1 to 3 weeks. Also the water spread stays fairly localized, so use more to ensure adequate coverage. 3>Keep the stakes in the ground as much as possible-both to protect them from accidental breakage AND to keep them as snugly and tightly in the ground as possible. ★【Easy-TO-Use】 - Longer than any others, more easy to insert. The only thing you need to do is just fill a bottle and insert the Terracotta Plant Water into the soil. Transforming manual watering planter into automatic watering planter. This self-waterier is made of terracotta. Please deal with it carefully!! ★★【E-co Friendly and Scientific 】- The watering globe is made of terracotta, More stiff and friendly to the plant. Recycling used wine bottles that can be used to water your plants for you, and the watering way is according to the humidity of the soil, never watering too much or less. 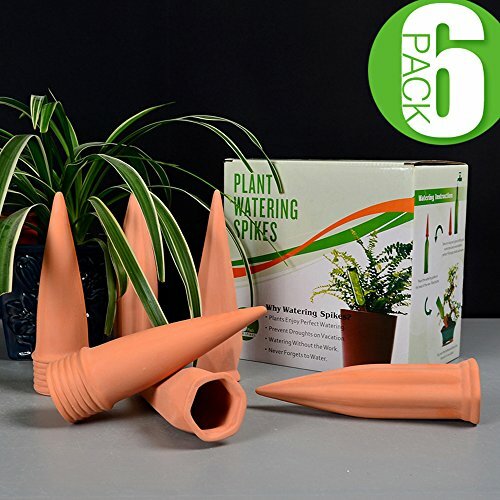 ★★★★【Perfect Choice for Watering Plant on Vocation】- Plant watering spikes work great for indoor or outdoor flowers, plants. You can go relax without having to worry about your plants when you go on vacation. Usually the average time is 7-10 days for a liter of water, depending on the dryness of your soil, humidity. It is suggested to test these automatic plant waterers before leaving on vacation for the most accurate watering time estimate. ★★★★★【Wide Application】-Versatility use both indoor and outdoor plants, Works with any size of bottle, but wine bottle will be better. ★★★【How the Watering Spike Works】-The watering spike can automatically seep out the water. When the pot soil is dry, there will be gaps in the soil, and the watering device will automatically seep out water until the gap fills and stops seepage. When the soil slowly becomes dry again, the watering device will automatically replenish the water and replenish it. So the self-watering globe ensure your plant get right amount of water all the time. Never worry about its growth. If you have any questions about this product by Wazonton, contact us by completing and submitting the form below. If you are looking for a specif part number, please include it with your message.